PowerColor has this week added a new addition to their range of graphics cards, in the form of the newly launched Radeon R9 380X MYST Edition. 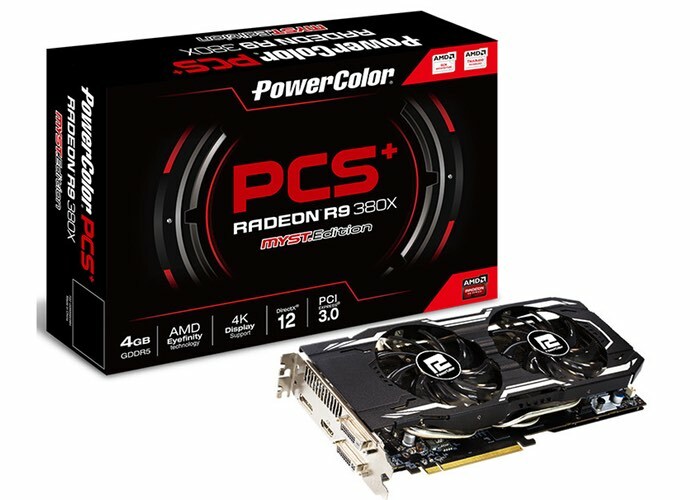 The PowerColor PCS+ R9 380X Myst Edition is equipped with 4GB GDDR5 memory and is based on AMD’s latest GCN architecture and supports AMD’s newest technologies in the form of Virtual Super Resolution, FreeSync and Liquid VR. The 4+1+1+1 multi-phases board design enhances the power efficiency and stability, and also delivers ultimate performance in overclocking mode. The PowerPAK SO-8 feature is not only for minimizing conduction losses with low 1m Ohm Rds(on), but also providing excellent and stable voltage with high peak efficiency up to 91.8%. Unfortunately no information on pricing or worldwide availability has been released as yet for the Radeon R9 380X MYST Edition, but as soon as information comes to light we will keep you updated as always.